We don’t know about you, but we have been binging the EFF out of Queer Eye season two and it’s got us feeling hella inspired to up our self care game, like now! It is so important that we spend time loving on our bodies, our brains and our souls. When we spend so much of our lives out in the world being affected by our surroundings, both good and bad, it can be draining and overwhelming to our skin, our confidence and our health. Take a moment to breath, remind yourself that you are worthy of feeling like a queen, and dedicate time, every single day, to you! This is simple, life altering stuff you guys! Fer Reals! Not only will you feel amazing and therefore live your life at a higher vibration, but the people around you will also benefit as their energy seeks to rise to your level. It starts with accepting that you are deserving, and allowing yourself to schedule non negotiable time, even if just a few extra minutes each day, to something that is just for you. No.One.Else! This could mean you spend an extra 10 minutes on an upgraded skin care routine, or set aside 15 minutes each morning to give meditation a try. Maybe it’s taking the time to plan and prep your meals for the week so you feel healthier, or carving out a half hour before you go to bed to enjoy a bath and a joint in peace. Whatever “Self Care” looks like for you, embrace it and prioritize it. It’s not selfish or vain, it’s important and it’s healthy AF! 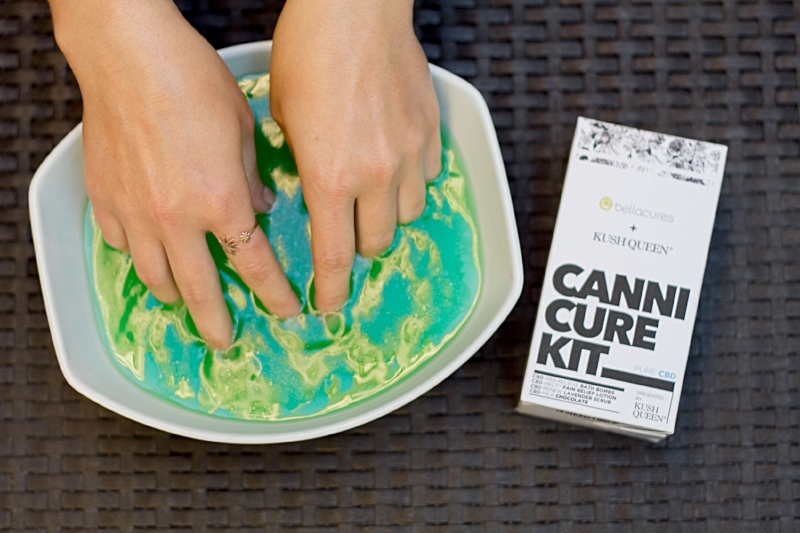 Want to get the most out of your Canni Cure Kit? We recommend you follow our guidelines below, but honestly there is no wrong way to use it as long as you are enjoying yourself. You will want to decide if you will be doing a manicure, pedicure, or both. You can double up your mini bath bombs for an extra relaxing foot soak or you can use a single bomb for your hands and a single bomb for you feet. The choice is yours. Start by filling a large bucket or bowl, big enough to comfortable fit both of your hands/feet into, with hot water. It needs to be pretty hot to allow for the bath bomb to dissolve completely. Once it has dissolved you can allow the water a moment to cool if needed for your comfort. Submerge your hands or feet into the water and relax. Allow yourself at least 15 minutes to really enjoy this moment and let that CBD do its job. When using the scrub you should apply it up to the elbows and knees. Apply lightly and rub in a circular motion. This will remove dead skin and lift the dirt from your pores leaving you feeling extra smooth and super clean. Rinse off with cool water to close those pores back up and dry off with a clean towel. This lotion will not only help to lock in all that moisture, but it does double duty as a pain relieving topical as well! Any remaining pain or discomfort will be eased away as you message the melt deep into the skin. Now you are ready to trim, treat and polish those nails with your fave colors, glitter, rhinestones, and whatever else your selfloving heart desires! You can devour this tasty little morsel whenever you like, as long as you remember to leave any guilty feels in the trash! If you want to kick off your spa day with a sweet and deeply relaxing treat, it goes great with the bath bomb soak. You can also save your chocolate till the end for a delicious grand finale. We also think it would go great with a moisturizing sheet mask and the latest episode of the Handmaids Tale. Honestly though, there is no wrong way to enjoy chocolate, so have at it! If you live in California and want to be pampered by a professional the you should definitely check out our Canni Cure treatments at your local Bellacures Salon. Don’t forget to tag and follow us @KushQueenShop & @TheKushQueens so we can see how you Treat Yo Self with Kush Queen!